FeedBurner is an amazing feed management system for websites. Since its beginning, FeedBurner has become one of the key tools for web based content publishers like bloggers and news service providers to promote their contents to the readers. It is also widely used by online traders for reaching their product description to the customers. Although the technology was first introduced to take out only the text based contents from a website; it was later used for traffic analysis in a website as well as for online advertising programs. In simple words, FeedBurner is a way of distributing website content and its technical name is RSS (Really Simple Syndication). The RSS is written in XML which is a standard language for formatting rich text to make them usable for the internet and online applications. So the viewer will see plain text where in the background the XML determines how the text will appear on the screen. Beside RSS, there is another popular form of feeds which is called Atom. Both of them work in almost same way. 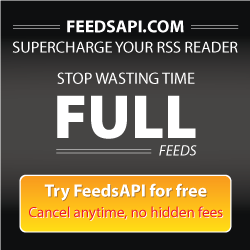 Creating full text RSS feeds using FeedBurner is very simple. First of all, it is a free service from our favorite search engine Google. All you need to start with FeedBurner is a Google account which I am guessing most of you have. This account can be Gmail or you can create a Google Reader Account just for using their RSS service. Creating this account is very simple and will take only a few minutes. With your Google account, you can log into the FeedBurner page from Google’s site. You will find a box for putting your site or blog page URL. In the next step, you will be asked to give a nice name to your feeds as well as a custom address. It will also offer you an option for tracking the traffic in your site. Once you complete these steps, you are done working with FeedBurner. Later you just have to redirect the feeds of your site to the new custom address. If you have a CMS based website, you can change site feed setting from the dashboard. In case of HTML site, you have to put the address manually.